So our Shamsul Maidin now tops the table in terms of World Cup Referee rating. In a way, it is good reflection on a nation of people who are deemed to be fair, firm and has integrity to uphold and abide by the rules and the law. So it got me thinking. What if our proposed referee school which I shall name it Kallang AcademY of Umpiring (K.A.Y.U.) were to take off with a great success. I am sure FIFA might as well just outsource the entire referee job to Singapore. That way, we would be sure that there will be no more corruption scandals like the current Italian Serie A match-fixing expose or the recent China rampant situation of the "Black Whistle" (referee bribery). EDB, are you listening? We can be a Football Referee Supply HUB! Like I mentioned in my previous blog, our referees shall be armed with the rotan. Especially useful when defenders lining up the wall refuses to stay clear of the required 10-yard perimeter from the free-kick spot. A few lashes of the cane at the wall and I guarantee you a very cooperative bunch of footballers, hence allowing the game to flow more fluently without stopping to deal with all these nonsense. The rotan also serve as a weapon of self-defense in the event where the players get overly aggressive towards the referee. Also, each yellow card shall be issued with a direct $50 fine that the player can either choose to pay on the spot with the EZ-Link chip embedded in their football boots or pre-arrange to have it GIRO-ed. Red card fines are $200. 5% GST not included. Whenever the team is awarded a corner kick, team managers will need to apply for a corner-kick permit at a reasonable price of $5 per corner kick (GST not included). Throw-ins are free but a special admin charge of $2.50 (GST not included) will be imposed if the throw is not done properly resulting a re-throw or a foul throw. Then there is the problem of the dubious 50-50 situations where the ball just bounced on the goal-line. It is very hard to tell if the ball has indeed cross the goal line or not. 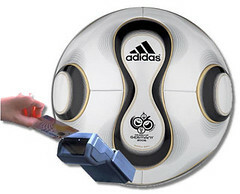 Hence, to resolve this argument once and for all, goal posts shall be fitted with a ERP Cash Card reader while the ball itself will be fitted with a In-Vehicle Unit. At press time, this concept is not ready to be deployed on a world-wide scale. The ball with the IU, cannot roll properly (See picture). Spokesperson from Singapore Technologies said that they are still looking into this problem and hopefully have it ready in time for World Cup 2010. ...Chewing gum will still be banned. HAHAHAHA this is HILarious & super good idea!! anyway this singaporean referee, dun play play. he's best in asia (based on the test results and his performance).. probably, he did the best referee job in this world cup. all hail Shamsul! Spinnee: Shamsul Maidin. Best in Singapore and JB. And some say Batam. I guess we can confer him Best in the World Cup 2006 as well. LOL! 老大, how about each player is only allowed 10 spits per game. More than that will have to face fines. Hahaha. ZheBin: Yah hor.... let me add to this. "... however, should a player need to spit more than the allowed 10 times, additional spit coupons are available at the nearest corner. FIFA has recently granted license to bidders who are interested to set up a mama shop in the corner. In order to enforce the spitting regulations, FIFA has also approved the addition of 2 more officials and shall be conferring them with the title of coupon aunties. These coupon aunties shall be equipped with a set of uniform, a bucket hat, an umbrella and hand-held summons printer for on-the-spot fines..."
Celly: Ahhh... welcome back. Haven't seen you around here for quite some time liao.